The NordicTrack C1650 is the top of NordicTrack’s more budget-friendly treadmills, generally priced at $1,299. While this treadmill may be classed with the more lower-priced treadmills, the C1650 doesn’t skimp on quality.With a 3.5 CHP motor, walkers and runners alike can enjoy using the C1650. It has 34 programs to keep you challenged and with the web-enabled, 10” touchscreen, you can work on fitness with guidance from professional trainers on your screen.If you are looking for a treadmill in the C1650’s price range, we highly recommend you consider the C1650 as your next treadmill. The C1650 is generally priced at $1,299. Have variable needs - With a 3.5 CHP motor, the C1650 can cater to the whole family’s workout needs, being a good choice for walkers and runners alike. There are also an array of programs of variable difficulty. Want engagement - Some people find using a treadmill terribly boring. With the C1650 touchscreen, you can have more engagement with your workout. Use the built-in Google Maps to escape to a new place for your run or workout with one of NordicTrack’s iFit trainers via your tablet. Want a reasonable price - Budget treadmills can sometimes be lacking in key features that more expensive treadmills have but it can be hard to commit to a more expensive treadmill. The C1650 is a good compromise, striking a balance between quality and price point. We are fans of the C-line of NordicTrack as they are still high-quality treadmills at a lower price point. High build quality - The C1650 has a strong metal frame and a large 3.5 CHP motor. The deck is equipped with FlexSelect™ cushioning, so users can change the deck between a firm run or a more cushioned one. With great home warranties backing up the quality build, potential owners can feel comfortable when purchasing the C1650. Packed with features - Want top-notch features for a reasonable price? The C1650 has you covered. With a 10” web-enabled touchscreen, 34 workout programs, and iFit technology built into the console, this treadmill can help users become excited to workout. Use the audio jack and dual speakers to plug in your MP3 player and keep yourself headphone-free. 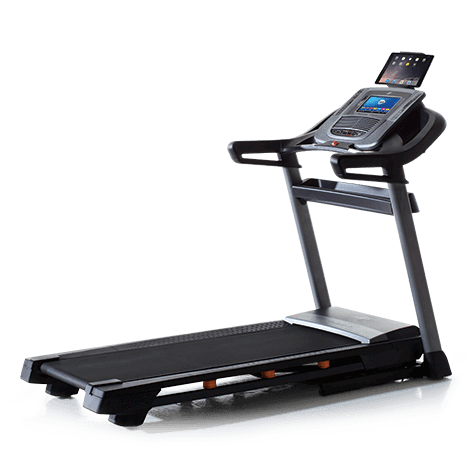 The C1650 is a good intermediary between budget treadmills and more expensive machines, with plenty of quality features for a good price. Footprint In Use (W, L, H): 35.75" x 78.3" x 56.4"
Motor Size - The motor in this treadmill is 3.5 CHP. This decent sized motor allows for a range of users to easily use this treadmill, accommodating walkers and runners alike. Running Area - The running surface is 20” x 60”. It lacks the two extra inches in width that the F65 offers, which may be important to some users. Weight Capacity - The C1650 is rated to hold 300 lbs. For those looking for a treadmill in the same price range who exceed this weight limit, the F65 can hold 350 lbs. Folding - A simple hydraulic system makes folding and unfolding the C1650 an easy task. Space / Footprint - The C1650 is a fairly slim treadmill when compared to many NordicTrack treadmills. It measures 35.75" wide by 78.3" long, and 56.4" high. Max Speed - The treadmills max speed is 12 MPH, which is very common. Incline - This treadmill has an incline range of 0% to 12%. This is a small incline range compared to other treadmills. Workout Apps - The C1650 comes with 34 programs loaded and ready to go. Pick a program based on your workout goals, whether they are calorie-based, incline-focused, speed training and more. It has iFit technology available which can give you access to more workout options. Display - Enjoy your treadmill workouts with the C1650 web-enabled 10” touchscreen. Watch shows, listen to music, and run in far off locations with the help of Google Maps. The screen is responsive to light touches and displays a variety of information as you run. Track your calorie burn, heart rate, distance covered, time and more. Speakers - The C1650 comes with two, 2-inch speakers. The sound is fairly crisp and clear until you hit the loudest volume levels then the sound becomes a bit tinny. Fans - Autobreeze™ fan technology comes with the C1650. You can manually adjust the fan speed or allow it to adjust automatically for you to match the intensity of your workout. The fan is in a fixed position, so if you are too far back you may not feel much of a breeze. However, if you workout toward the front of the treadmill, the fan can be very cooling. Heart Rate Monitoring - EKG handlebar grips are the only heart rate monitoring equipment that comes with the C1650. It is compatible with heart rate monitoring chest straps but you have to purchase one separately. iFit enabled - The C1650 comes with iFit technology integrated into the console. With iFit you can unlock more workouts, personal coaching, and more. Tablet holder - Multitask while on your treadmill by using the adjustable tablet on the C1650. It is mounted on the top of the console. Accessories holder - On either side of the C1650 console there are water bottle holders. Located under the console is a device holder for any overflow of accessories you may need for your workout. Customer Support - NordicTrack fitness consultants are available online and over the phone to answer the questions of both users and prospective buyers. Return Policy - 30-day money-back guarantee for anyone not satisfied with their purchase with a 10% restocking fee. Fee waived if product defective/damaged. The C1650 has a slim metal frame which is sturdier than it looks. Our testers have run on a 12% incline and the C1650 has remained steady and quiet. It does have slanted side rails like the NordicTrack C990, which can be a bit awkward to stand on. However, the side rails are textured so you don’t slip. With the FlexSelect™ cushioning, you can adjust the cushioning of your treadmill deck. There are three points on each side of your treadmill where you can either turn on the cushioning for a softer surface or off for a firmer deck. With top of the line electronics, the C1650 takes your workout to the next level. Enjoy the smooth action of the 3.5 CHP motor as you challenge your body with 34 different programs, with more available through iFit. We recommend the C1650 for anyone who is looking for a machine which is a step above entry-level treadmills and still has a reasonable price tag. Potential purchasers should go through NordicTrack to buy their C1650. This is the best way to make sure you have the best price and customer experience.